Under the direction of Dr. Benjamin Locke (Kenyon College), this annual Knox County Symphony event is designed with little ones in mind. Always with an exciting theme, the concert introduces children to the exciting world of symphonic music in a beautiful outdoor setting. 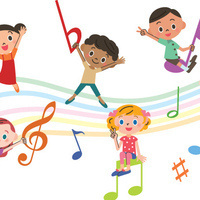 Children can dance and move to the music, while exploring the instruments, their sounds, and maybe even have a chance to direct a song! They can climb the hillside terraces of the park while listening to the beautiful expertise of the talented musicians of the symphony orchestra. In partnership with the Knox County Symphony, the Gund Gallery will offer an activities tent during the concert. They'll be making several music-themed projects including a musical instrument collage. Ariel Foundation Park, Rainsite: Rosse Hall Auditorium on the Kenyon College campus.